Figure 1: Location of the Jameson Land Basin. A series of Late Palaeozoic-Mesozoic basins, which formed as the result of rifting between Greenland and Norway following the Caledonian Orogeny, are exposed in East Greenland between 70° and 76°N (Stemmerik et al., 1993). The onshore Jameson Land Basin is one of these basins and is located along the south-eastern continental margin of East Greenland (Figure 1), representing one of the last remaining undrilled North Atlantic Margin basins. Based on seismic, gravity and magnetic data, and regional surface fieldwork mapping, the basin contains up to 17 km of Upper Precambrian to Upper Mesozoic sediments. To the west and partially to the east, the basin is bounded by tectonically uplifted Precambrian basement and Upper Precambrian to Palaeozoic sedimentary rocks and granitic intrusives. The lowermost part of the basin’s sedimentary section is characterised by at least 900m of continental coarse-grained clastic deposits of Devonian, Carboniferous and Lower Permian age. These sediments are unconformably overlain by 900-1800m of shallow marine and continental Upper Permian to Triassic rocks that contain considerable amounts of carbonates, evaporites and red-beds, representing a period of rifting and graben development during the initial stages of separation of Greenland from northern Europe. This event was followed by marine, mainly clastic sedimentation, which continued throughout the Jurassic and into Cretaceous times. The culmination of this was during the Early Tertiary when the entire area was subjected to widespread magmatic activity, associated with rifting and oceanic spreading related to the opening of the Atlantic Ocean, which was accompanied by block faulting, major uplift and erosion of the basin. Palinspastic restoration of the conjugate margins of the North Atlantic Rift System clearly demonstrates the significant pre-tectonic fit of the Jameson Land Basin with the petroliferous Haltenbanken area of Mid Norway (Figure 2). Spatial and temporal relationships observed through palaeogeographic mapping further increases the hydrocarbon potential of the Jameson Land Basin. This includes several key plays that have been fairly recently identified by drilling, such as Permian carbonates and Triassic-Jurassic clastics on the Loppa High, south-west Barents Sea, found by Lundin Petroleum. Other analogues include oil-bearing Lower and Mid Jurassic sandstones of the Trondelag Platform, Haltenbanken region of Mid Norway (e.g., Heidrun Field), and Lower Triassic Otterbank Sandstones of the Strathmore Field, East Solan Basin, UK Continental Shelf. 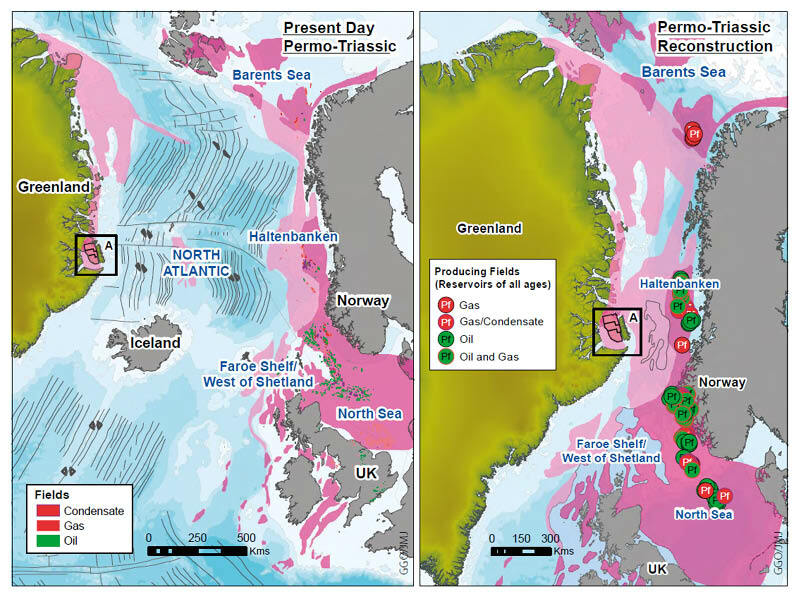 In light of these remarkably strong genetic relationships, and the wealth of play opportunities, the Jameson Land Basin provides a unique opportunity to drill one of the last remaining North Atlantic Margin basins, which once sat closer than you probably thought to the heart of the prolific North Sea Hydrocarbon Province. Figure 2: Restoration of the conjugate margins of the North Atlantic Rift System. GOG/JMJ In 1972, based on detailed field mapping, Atlantic Richfield (ARCO) ranked the Jameson Land Basin as having the highest potential for hydrocarbon accumulations in East Greenland. Remember, in 1957 ARCO was the first company to discover oil in Alaska, and in 1968, with Humble Oil, was responsible for discovering one of the largest oil fields in the circum-Arctic region, the Prudhoe Bay oil field on Alaska's North Slope. In the ‘80s, ARCO's international arm made the first commercial gas discovery in offshore China, further demonstrating the company's insatiable appetite for finding major oil accumulations in remote frontier basins. For a five year period, ending in 1990, ARCO as operator undertook numerous field mapping, sedimentological and geochemical outcrop studies, and acquired seismic, gravity and magnetic data over an area approximately 10,000 km2 in the central part of the Jameson Land Basin. During this time the company, partnered with ENI, accumulated a wealth of data across the entire basin through a focused and diligent exploration campaign, which culminated in the identification of a multiple play system with very attractive estimated cumulative reserves for both oil and gas. ARCO's principal focus at that time was the Upper Permian shallow marine platform carbonates and reefal build-ups of the Wegener Halvø Formation, which from seismic mapping appear to provide significant trap potential. Several drillable large closures have been identified that are both surrounded and draped by oil-prone shales of the Upper Permian Ravnefjeld Formation, which provides a very favourable juxtaposition of both source and seal. A number of in-depth field-based studies have also been carried out by the Grønlands Geologiske Undersøgelse (Greenland Geological Survey), and subsequently by the Geological Survey of Denmark and Greenland (GEUS), all supporting the existence of a multiple play system in the Jameson Land Basin. So the big question has to be "why did ARCO relinquish the Jameson Land asset in 1990 after almost 20 years of considerable interest and spend?" The company also stepped up its efforts to bring foreign reserves into production. ARCO had discovered an 85-Bcf gas field in 1982 off the south-east coast of China, but had been unable to exploit the find. As a Chinese joint venture, the operation had to meet the Chinese regulation that it be a self-sustaining project, in effect, requiring the gas to be exported for hard currency. That operation was finally made feasible in 1992 when ARCO completed a deal to pipe the gas to Hong Kong with the construction of the 480-mile Yacheng pipeline at a cost of $1.13 billion. It appears, therefore, that the driving force for ARCO to relinquish the block in 1990 was due to a number of mitigating circumstances, instigated by the downturn in oil and gas price, and the need to fund several more favourable major development projects, such as the China-Hong Kong pipeline. In other words, bad timing for the Jameson Land technical exploration G&G team, who had devoted so much time, effort and enthusiasm into a long-term project that was just moving into the final drilling phase. 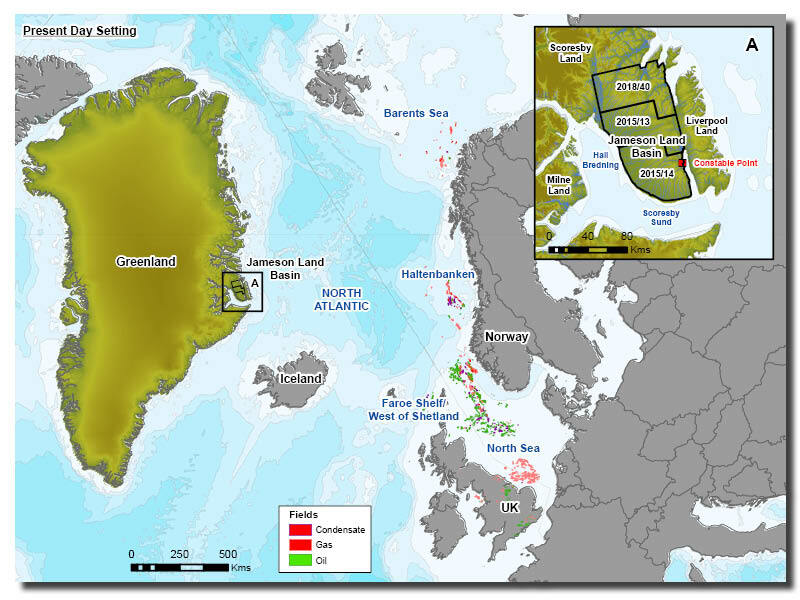 Over the past five years, Greenland Gas & Oil has undertaken several regional to field-scale studies to evaluate the hydrocarbon potential of the Jameson Land Basin. In addition, more focussed geological and geophysical work has been carried out on two operated licences, 2015/13 and 2015/14, with a view to identifying potential drillable oil and gas targets. The initial phase of this work incorporated existing data from ARCO and its partner ENI, including 2D seismic data (Figure 3) and extensive field work, more recent field work and studies conducted by GEUS, as well as technical papers and reports in the public domain. The culmination of this fieldwork and 2D seismic mapping, together with associated studies, is the confirmation of the presence of a Permian basin containing a sedimentary sequence directly correlatable with the Mid Norwegian Haltenbanken hydrocarbon province. This is supported by palaeotectonic modelling and palaeodepositional mapping, which clearly demonstrate the strong genetic relationship (both temporally and spatially) of the two regions, with a close pre-tectonic fit of the two conjugate margins prior to Tertiary North Atlantic opening (Figure 2). Figure 3: Data availability for the Jameson Land Basin. A indicates the location of an oil-filled belemnite from the ‘Blokelv’ core at a depth of 105.25m. B is the location of the seismic line shown in Figure 4. The entire 2D seismic dataset (1,798 km) has been recently reprocessed and reinterpreted, and has identified many potential exploration opportunities across the basin's sedimentary section, from the Carboniferous through to the Jurassic. Viable play concepts have been identified and the risk and uncertainty of all the key essential play elements - source, reservoir, seal, trap, charge and preservation - for each individual play evaluated, significantly enhancing the prospectivity of the area. Airborne full tensor gravimetric, magnetics and LiDAR data were acquired by Bridgeporth in August 2017, and are currently being integrated into the new seismic interpretation to provide an enhanced insight into the structural geometry of the basin. Both the gravity and magnetics (Figure 3) are proving to be invaluable with regards to identifying major compositional basement changes, depth to basement estimates, and defining the extent and distribution of Tertiary igneous intrusive sills and dykes that are prevalent in the southern parts of the basin. The LiDAR data has also been useful in the mapping of the surface expression of these doleritic dykes, together with other major lineaments that often represent faults and fractures. 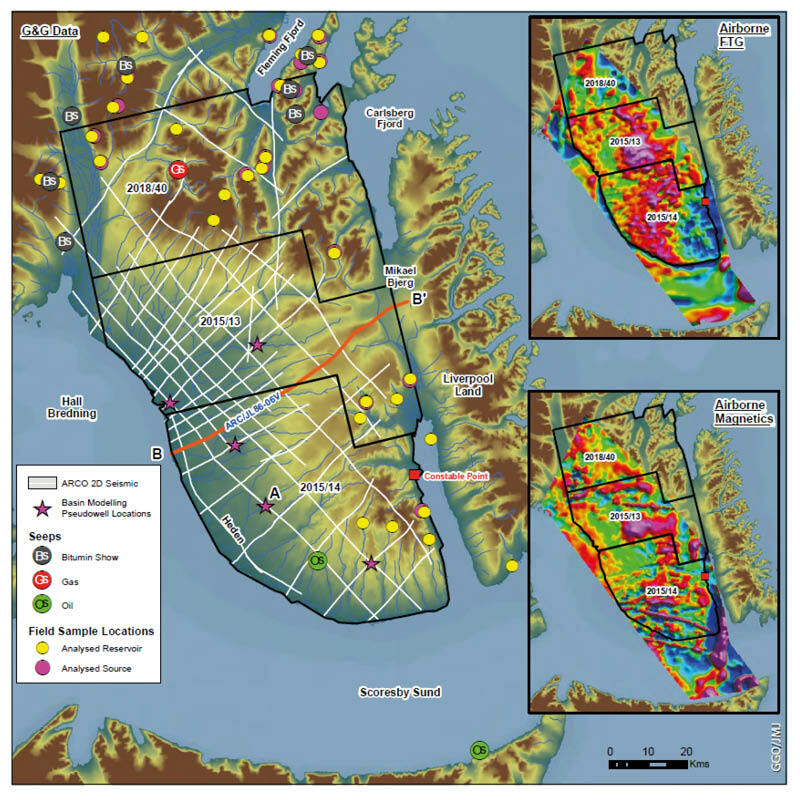 Greenland Gas & Oil has built a consistent and detailed regional geological database and has undertaken a petroleum systems evaluation of the entire area, including source rock evaluation and basin modelling. These studies, integrated with the seismic interpretation, have provided an invaluable new insight into the petroleum system of the Jameson Land Basin and has identified over 50 key prospects and leads in eight independent plays. Source: There are four main potential source intervals present in the Jameson Land Basin. Laminated restricted-marine black shales of the Upper Permian are the lateral, coeval equivalents of prospective carbonate reservoirs. They are oil prone and show excellent potential. 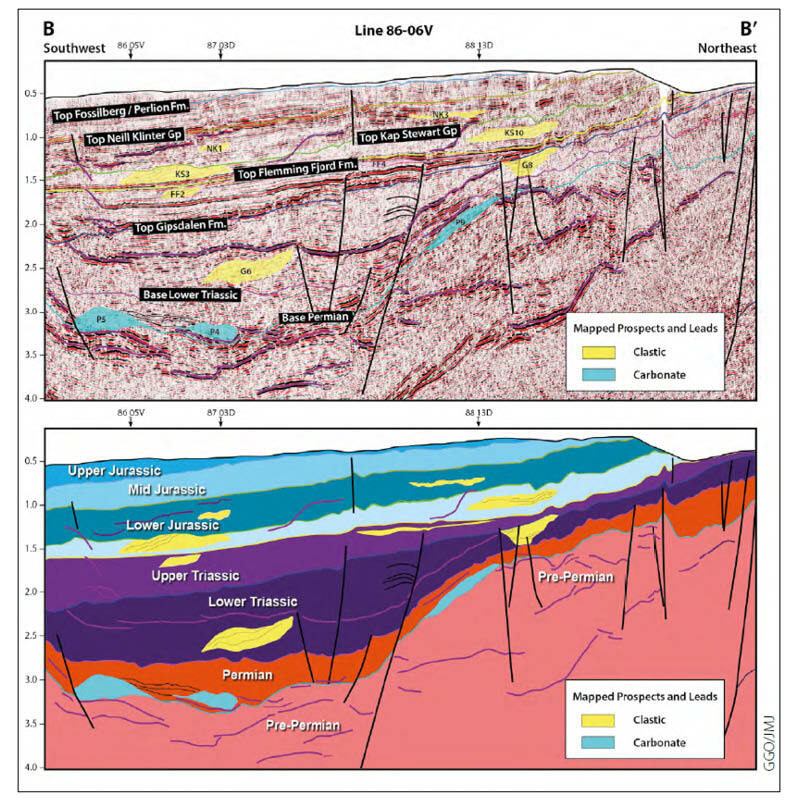 Lacustrine shale sources are present within Mid-Upper Triassic and Lower Jurassic sequences – analyses of these units from outcrop reveals good to excellent potential for oil generation. Upper Jurassic marine, organic-rich, black shales, equivalent to the proven Spekk and Kimmeridge Clay formations of the Norwegian and UKCS margins, are present in the basin and, where mature, will provide additional charge. They are commonly incised by deepwater sandstone units, in a setting similar to the productive Magnus sands in the Northern North Sea. It is highly likely that the thickest and highest quality oil-prone, organic-rich source rocks will have been deposited in the main depocentres – central and southern areas – of the basin system, away from areas polluted/contaminated by the influx of coarse clastics derived from sediment input points along the margins of the basin. This entire potential kitchen and charge area is covered by blocks 2015/13 and 2015/14, an area identified by Greenland Gas & Oil as a key area of interest prior to the blocks being defined and offered for licence. Expulsion and Migration: Basin modelling of several optimally positioned pseudowells in the basin demonstrates that in the deepest parts of the basin the Upper Permian sources achieved initial expulsion of oil and gas in the latest Triassic, with expulsion at shallower locations from around the Early Cretaceous. Triassic lacustrine shales began expulsion of oil with minor gas in the Late Jurassic to Early Cretaceous, with similar Lower Jurassic sources expelling from the Early Palaeocene. Upper Jurassic marine shales do not quite reach expulsion maturity across much of the basin, although significant oil generation is achieved, beginning in the Mid Cretaceous. In the offshore areas in the far south of the basin particularly, these shales are buried more deeply and are likely to have expelled oil. Peak expulsion from the Lower Jurassic source was achieved in the Early Eocene with peak expulsion from the Upper Permian and Triassic sources in the Early Jurassic and Early Cretaceous respectively. Expulsion from all sources had ceased by the latest Eocene, either due to exhaustion of the sources or due to continued post-volcanic, Late Eocene uplift. A lack of faulting in the post-Triassic section may result in fault-fed migration being limited in the basin above top Triassic level. Juxtaposition of source and reservoir, such as is envisaged for the majority of the plays in the basin, results in short distance lateral migration being the key mode of hydrocarbon charge. Reservoir - Principal and Secondary Plays: Good to excellent reservoir characteristics are observed in core and outcrop. The central and southern areas of the basin provide the best preserved total sedimentary section from the Devonian to the Lower Cretaceous providing multiple play intervals. and Mid Jurassic shallow marine-deltaic sandstones of the Pelion Member of the Vardekloft Formation and the Olympen Formation shoreface sands. Secondary play targets may include Carboniferous clastic reservoirs, largely in the northern part of the basin where they occur at viable drilling depths, and Upper Jurassic Hareelv Formation deep water shelf/basin turbidite sandstones in the southern offshore extension of the basin. Seal: Adequate seals are expected for all potential reservoir levels. The shales themselves may act as the source for hydrocarbons, reducing the risk of long distance migration and seal breaching. Trap: Multiple large-scale clastic stratigraphic traps have been identified from the interpretation of the 2D seismic data, with several occurring at optimum drilling depths within the Jurassic and Triassic sections. As identified by ARCO, numerous significant Upper Permian carbonate build-ups and reefs occur throughout the basin. Preservation: Maximum preserved sediment thickness in the basin, and tectonic uplift and denudation modelling demonstrates that these areas were the main depocentres prior to significant Tertiary uplift and erosion of 2-3 km across the basin. Basin modelling shows that several key potential source rock intervals within the Palaeozoic and Mesozoic section could have attained depths of burial that will have placed them in the oil window prior to the Tertiary uplift event. Several optimally positioned wells have already been identified, which would test four key plays, including several of the largest currently mapped structures in those plays, with a resource range of >1 Bboe P50 unrisked resource across the four plays. We consider the Jameson Land Basin to have significant potential for both oil and gas. A number of sizeable prospects and leads have been identified and mapped, suggesting the potential for multi-billion barrel prospective resource volumes within the current licensed areas, occurring at viable drilling depths. Initial prospect mapping and volumetric calculations identified gross un-risked P50 recoverable resources in the region of 3.5 Bboe with an estimated average Chance of Success of 1:10. The Jameson Land Basin provides an exciting opportunity to explore and drill one of the Atlantic margin's last remaining untested basins, which appears to contain multiple plays and all the essential play elements required for significant hydrocarbon resources. Play analogues, such as those from the Barents Sea and Mid Norway, strongly support this concept. As with all basins, there are differing degrees of uncertainty and risk; however, we feel that the geology and rewards on offer make the Jameson Land Basin a potentially world class petroliferous basin ready to drill. Covering an area roughly the size of California and Texas combined, the US Atlantic margin is underexplored, but prospective basins along the margin may once again be open to exploration.